Can we overload main in Java? public static void main(String args) or public static void main(String args...) which is the main method as variable argument method and only supported post-Java 5 world. Can we override main in Java? No, you can not override the main method in Java, Why? 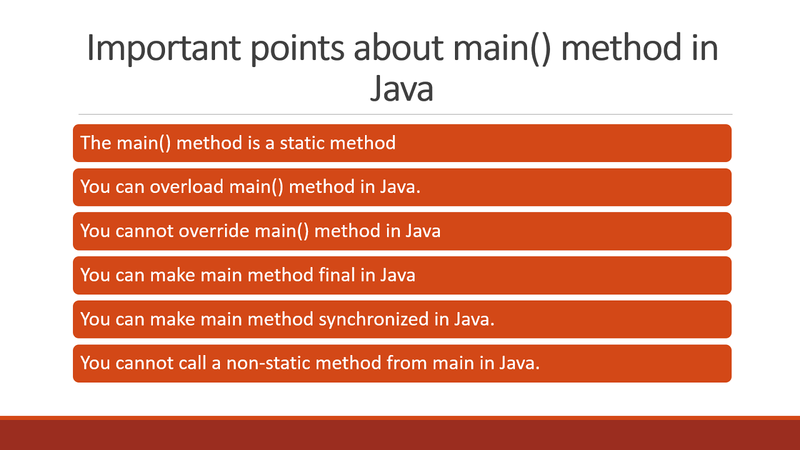 because main is a static method and in Java static method is bonded during compile time and you can not override static method in Java. If you declare a method with same name and signature its called method hiding. Of course, you can make the main method final in Java. JVM has no issue with that. Unlike any final method, you can not override main in Java. Yes, main can be synchronized in Java, synchronized modifier is allowed in the main signature and you can make your main method synchronized in Java. You can overload main() method in Java. You can make the main method synchronized in Java. You cannot call a non-static method from main in Java. So these were some of the frequently asked questions about the main method in Java. This does not only help to answer interview question but also to build your concept on the main method in Java. I never thought that someone will ask main() method related question on core Java interviews but I was wrong, they do, especially why main is public static and void in Java?